The Community is structured around many teams doing various areas. Each team generally has a team leader, who liaises with the Committee of CAcert Inc, a.k.a. the Board, the executive of the Community. Teams also work to the policies, and are occasionally subject to Arbitrations. Thus there are three centers of gravity in CAcert's community: the board, the policy group and the arbitration forum. These three centers are peers in power, all interlocked, and in some senses mirror the political structures found in some countries: the executive ("presidency"), the parliament ("makers of laws") and the judiciary (courts). new software birdshack team and old software team. Every team will have several people sharing tasks. One of those will take or is acknowledged as the lead and is referred to as leader. Jan Dittberner according to m201?????.? Please don't add new lines without consultation with board. Adding a line doesn't make it so. The following is some basic questions on how our teams work. What does a Team Leader have to do? Provide reports on request by the Board. Keep their areas in the wiki up to date. Look out for new team members and help them to contribute. Share problems, ask for help. Tell us when you can no longer do the job. It is a responsibility to hand over. How can I take part in a CAcert Team? There is no special or guaranteed or written path. In general, help a lot and join the team informally. Contact the team Officer as shown in the chart, and ask. If there is no team, do *something* in CAcert, help make it known (contact any Officer). Then suggest you try this and that on your area. Finally, you can write to cacert-board@co and ask team-related questions. Start informing yourself about the area. Read through the wiki on that area. Look for the list of outstanding tasks. Help on the outstanding tasks. Subscribe yourself to any of the CAcert email lists and take part. Also, join the Association, as per m20070917.8 which says that "(Non-board operational) Officers of the project of the organization should be members of the association CAcert Inc.; the Board can make exceptions to this rule." How do I resign from being a role? Please contact and inform everyone in your team, other leaders and the board. There is of course a conflict here. Everyone must put their life, family, job first. But we also have a responsibility to hand over the task to others. The minimum is to let us know, so we can pick it up. Ideally, work with the team or someone else to help the transition. If there are any critical assets then it is your responsibility to hand those over, and this requirement is independent of the circumstances. possibly re-engaged in another area. Especially security areas are sensitive to these restrictions. Each leader is expected to clearly describe any potential conflicts of interest. This is as much to protect you as it is to protect the community; your work boss may ask you to do things that you might have trouble refusing, and these things may cause a breach of CCA/SP, a breach of the law, or a breach of our principles. We can much better deal with these conflicts if they are known about and thought about in advance. 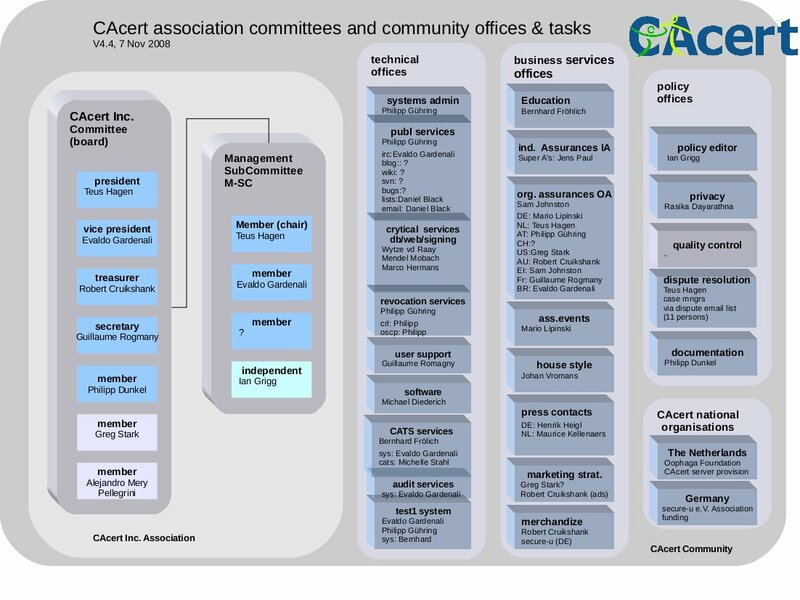 In the period of 2006 to 2008, CAcert built out its organisation structure by appointing officers to various tasks. This area was initially managed by Advisory then by ManagementSubCommittee (M-SC) and ultimately by Board. Every Office was defined by some service/task (a product) for CAcert services (the products) within and for the Community. Every Office would have certain persons from the Community taking up some task in the Office. One of those persons will take or is acknowledged as the lead and is referred to as Officer. Historically, there was also some writing about ProductManagers, but this never worked out. An old organigram is found here: Organization Structure Chart (PDF format). As of 2009 there was general agreement at the board level that the Officers process was causing as many problems as it was solving, and the term was dropped from general management. To some extent, we started using the term team leader to refer to the same thing. The emphasis was changed from one person to one team. Curious, to name persons and teams without common agreement about the project structure. Again 3 functional areas with various working sections (=teams) would make sense! comma is just an area, consisting of community (&) communication, (marketing) arsenal with the strongest weapon or "front ends" the assurers or orga assurers, and campaigns as events or fundrising. identity is as well in comma as it is a marketing issue, but to give strong emphasize it is a separate section. * Audit will have to split into business areas Registration Authority (RA) and Certificate Authority (CA) only. * From Audit work practice: (RA): Arbitration, Policy Group, Assurance Area, Education (CATS), ATE (combined but separated area of Assurance and Education), Co-Audit, Systems (CA): Critical team, Access-Engineers, Infrastructure team, Software-Assessment, Software-Development are the working areas. * Community view: Policy Group (legislative), Board (Executive), Arbitration (judiciary) are the areas.